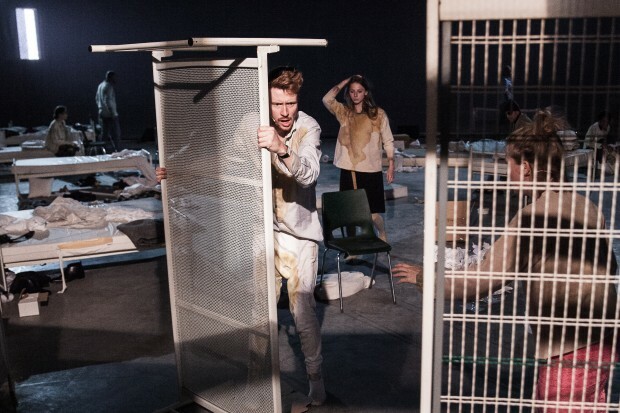 Stad der Blinden (‘City of the Blind’) is the theater adaptation of the well-known novel in which city dwellers affected by an epidemic of acute loss of vision are quarantined. The wards, one for the blind and one for people at risk, are horrible and quickly become a playground for the basest of human behavior – survival of the fittest. In Thibaud Delpeut’s vision, the story isn’t about psychology and character arcs; rather, his sketchy and sometimes rudimentary scenes seem wholly devoted to the bigger picture: Stad der Blinden is about humanity under duress, in its most extreme form. An excellent Karina Smulders as the Doctor’s Wife – the only one who can still see – sits at the front of the stage and acts as our eyes and ears, a narrator of sorts. In the ward, the same role is played by Wendell Jaspers. Loud and explicit fragments are displayed onto a screen between us and the asylum at irregular intervals, the kind of thing the blind might see in their despair. Perhaps this is taking it too far at times, and the physical division of the screen also works to detach the audience from what’s happening inside. Impressive set design by Roel van Berckelaer, however, is truly at home in the gigantic NDSM Lasloods, which in all its imposing industrial majesty must be the perfect location for this production. Desolate and slightly scary, the former ship welding hangar produces echoes that give the performances extra oomph. Stad der Blinden may be more of a fleeting experience than a literary foray into the depths of the human psyche, but the portrayal of suffering and, eventually, reconstruction is powerful nonetheless. Pictures courtesy of Roel van Berckelaer.